Here we are in June, and summer is heating up, (or "hotting up" as I've heard them say in countries where they don't talk American). In addition to the end of the NBA and NHL seasons, getting ready for the MLB All-Star game, and all the NFL fans wishing it wasn't June, there is one other sporting event coming up you might have heard about. One of the most famous, if not THE most famous auto races in the world is the 24 Hours of LeMans, and this year's edition will be epic! Coming up next weekend on June 18-19, you have two choices on how to watch it! Of course you could just go buy a ticket and fly to France for all the festivities, or you could even watch the ENTIRE RACE from the comfort of your own home! We found the information below on line, so now you only have to decide if you want to watch it all jet-lagged wearing a beret and smoking French cigarettes while eating a baguette at LeMans, or just stay home! (We won't be doing either one, since the NMS team will be auto crossing both days). 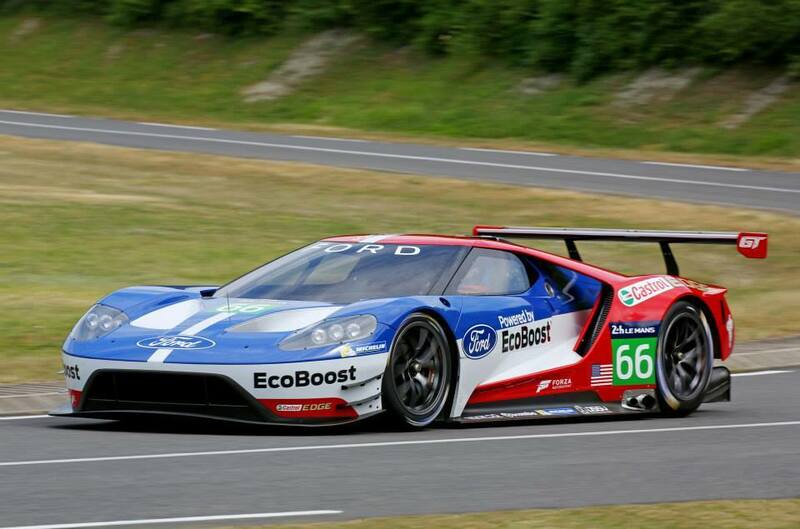 The new version of the Ford GT will be running in the race, so if you're familiar with the 1960s battles between Ford and Ferrari at LeMans, or have ever seen a Ford GT, then you know how exciting this is to have Ford competing again at LeMans. The main story behind Ford even entering the race in the first place, is that Ford was negotiating a deal to buy Ferrari in the 60s, but at the last second Mr. Ferrari cancelled the deal. Mr. Ford was so upset that he vowed to compete and beat Ferrari on the track, specifically at LeMans, no matter how much it cost! Bottom line, with the Ford GT40 and a lot of money and expert drivers, Ford did exactly that! While the Ford-Ferrari rivalry doesn't really exist today, it's a big part of motor racing history. If you follow any racing at all, you probably have your favorite NASCAR/INDY/F1/NHRA or whatever team and driver, and you'd recognize their car, number, helmet, or sponsor ads right away. That's why just tuning into a different race (like LeMans) is really weird, because at least for me, all of a sudden I have no clue who is winning, what team is what, and etc. I guess I'll admit that this feeling is probably what non-racing fans get anytime they watch a sport they aren't familiar with, so I have to admit that it's OK if you don't like every sport your friends like. (but you should!). If following a race for 24 hours or learning about three new classes of cars is confusing, you can always go find the old movie "LeMans" with Steve McQueen and have a pretty good couple of hours too!